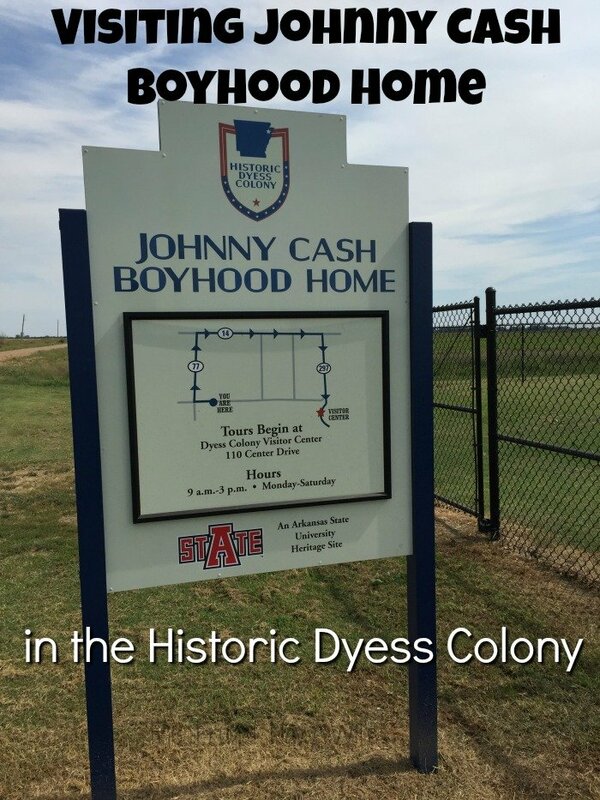 Johnny Cash Boyhood Home is in the Historic Dyess Colony. 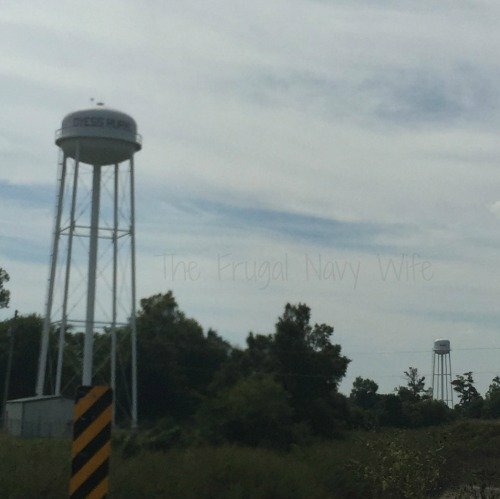 While in Memphis Tennessee we drove out to Dyess Arkansas. This where Johnny Cash was raised. 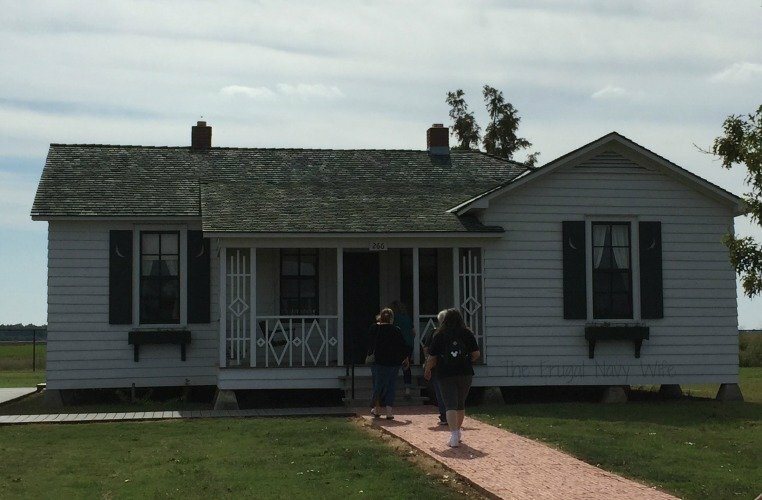 His boyhood home is in the Historic Dyess Colony. Until visiting here, I had never heard of the resettlement communities. 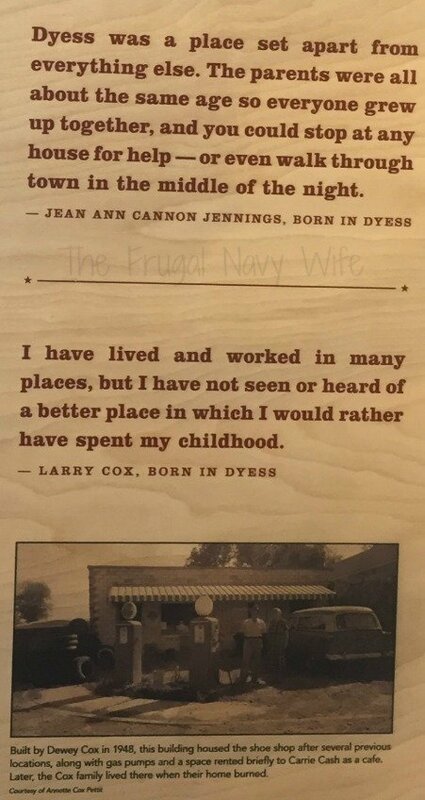 What is the Dyess Colony? 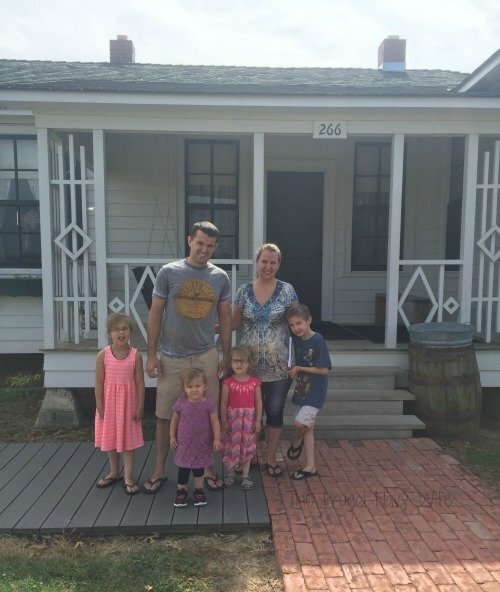 At the time the Cash family had five kids when they moved into this two bedroom home, and two more children were born here as well. The Cash family like the others who moved to Dyess Colony were given 40 acres of land, a two bedroom house, and only 1 acre of land was cleared. The families had to work to clear the rest of the land to farm. Each family was also given the equipment to farm the land and several animals along with a few buildings like a smoke house and small shed. The agreement was to pay the government back as the farms started to make money. The town had everything they needed, stores for groceries and supplies, schools, a theater, hospital, and even administration buildings. There were homes for the government employees who ran the shops and buildings as well. Not everyone loved this agreement and then in 1937 the community flooded. 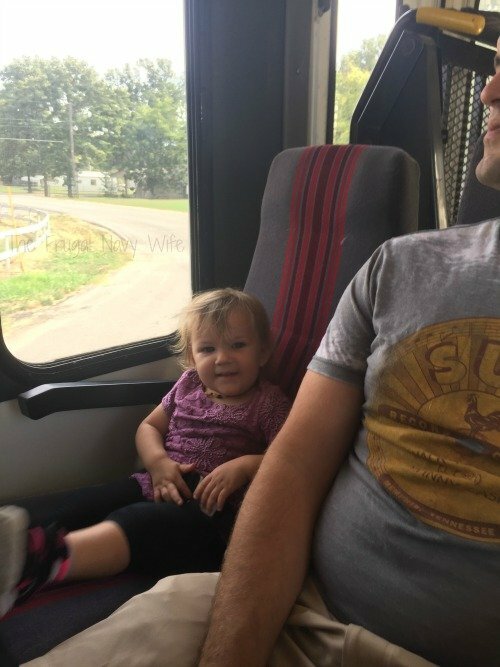 You can recount the event in Johnny Cash’s Song “Five Feet High and Rising.” The town was evacuated, and many just didn’t come back to farm their land. A neighbor of the Cash’s was one that didn’t come back, and they were able to buy the land and expand their farm. We were told Johnny didn’t attend many high school reunions; he didn’t want to steal the attention away from the people there who wanted to reconnect. His family has shown up randomly to do tours of the house which I think would have been great to see!! 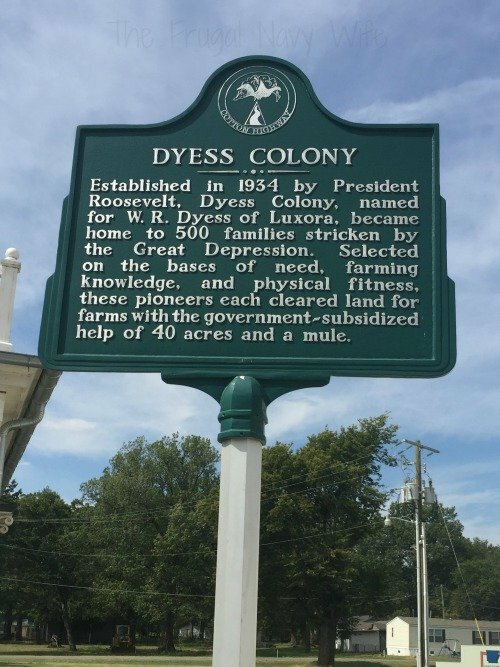 When you get into Dyess, Arkansas the way it stands today it’s all farm land. You head to the middle of town and then to the old administration building. It is now part of the two building museum. The town is situated around the central circle which has a cute small town set up. In the building where you buy your tour tickets, there is a movie about how they renovated the community. It also talks about Tommy Cash, Johnny’s younger brother, and his career. 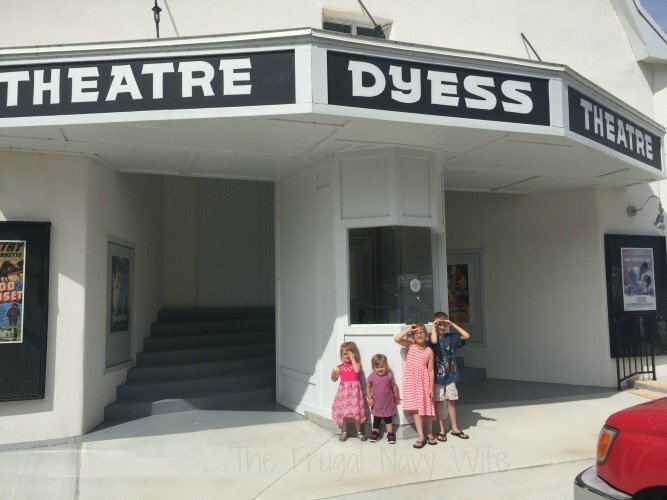 While heading to the 2nd part of the museum, you pass the Dyess Theater. 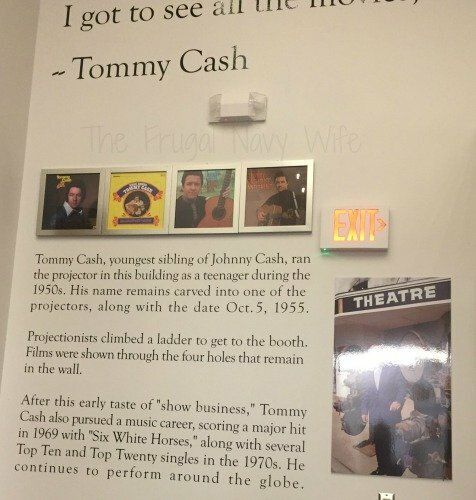 The 2nd part of the museum is in the old administration building and covers the history of the colony and Johnny Cash. 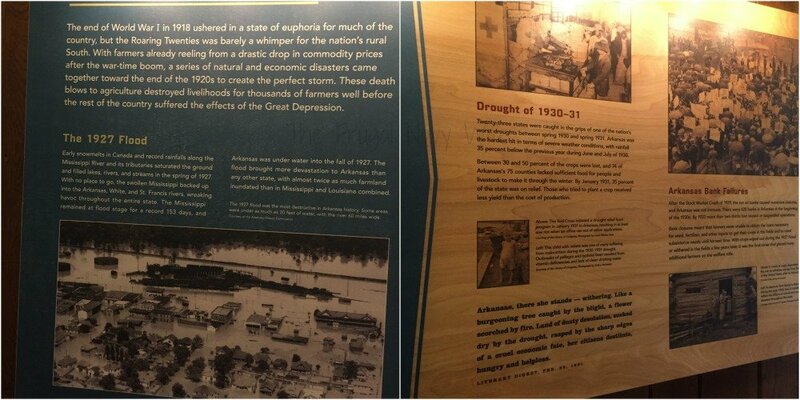 The area ended the depression in 1927 with a flood followed by the 1930 drought. It wasn’t an easy area to live in. The kids that grew up in Dyess had great things to say about the small town. It really sounds like the kind of place we hope to find and settle in one day. 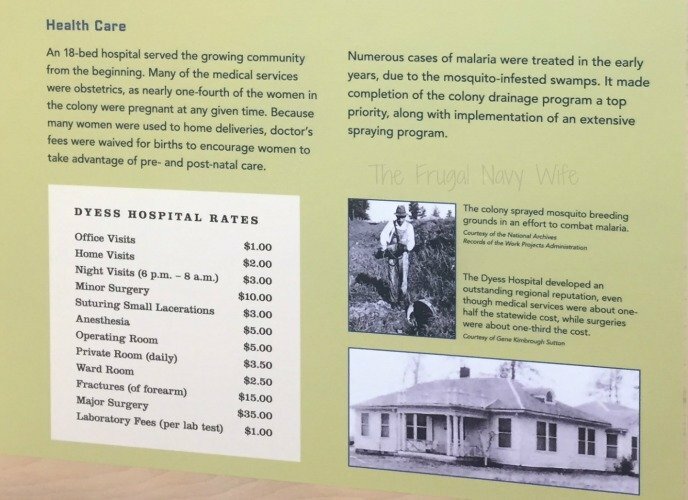 I got a kick out of this chart of the hospital rates, and I wish these prices were still available today! Only $1 for an office visit and $35 for major surgery! Families were on a tight budget that had to be approved by the colony. 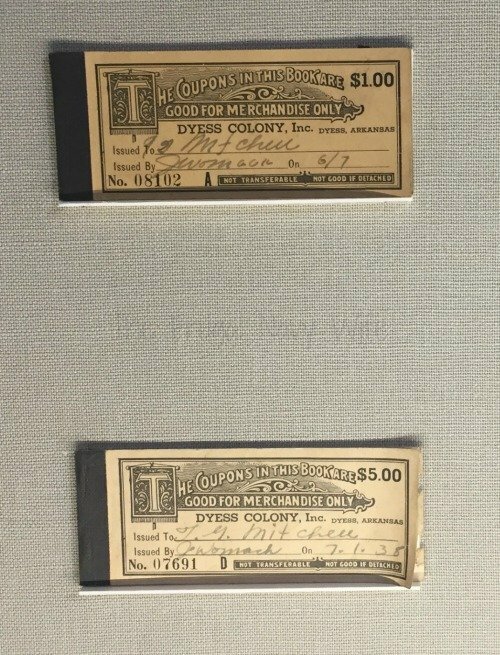 They were supplied with things they needed and many times families were issued coupons for items needed instead of handed cash. Then they traded the coupons in at the store. 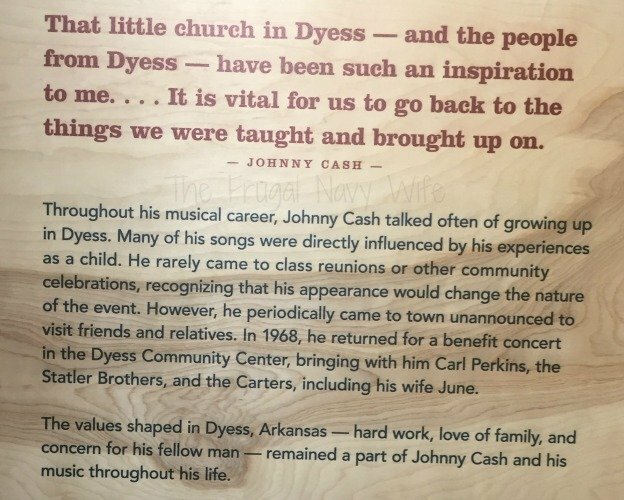 When your tour time comes, you hop on a little bus, and they drive you the 3 miles outside of town to Johnnys Cash’s boyhood home. I will say I was shocked just how small the house was for the size of Johnny’s (J.R.s) family! 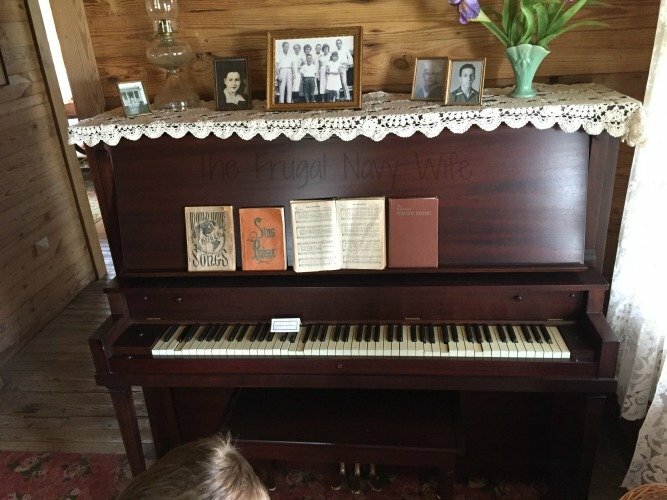 You walk into the living room, and they have family pictures up and the piano Johnny practiced on! To the left was the dining room and it was all set up. Also to the left of the living room and behind the dining room was the kitchen. That also led to the back porch. 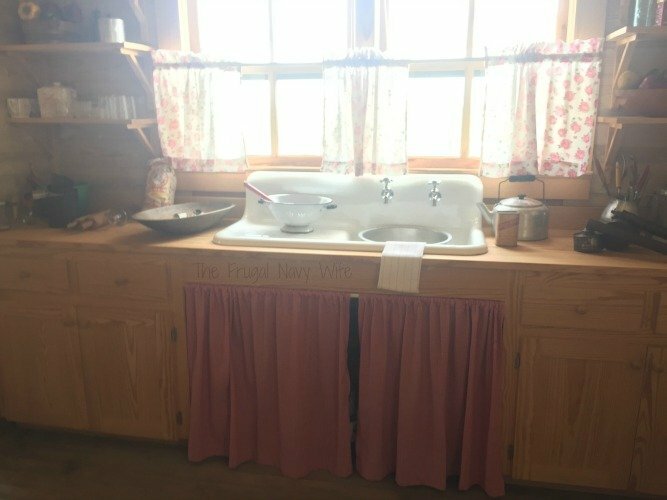 The kitchen had the basics a wood fire stove, a sink, and small counter space. 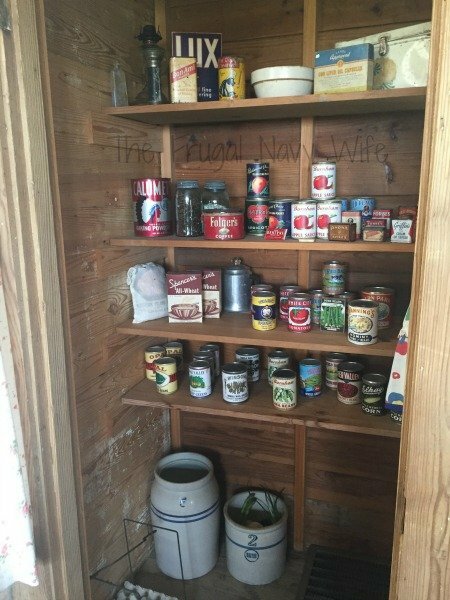 The pantry was even stocked with items from the store back then. 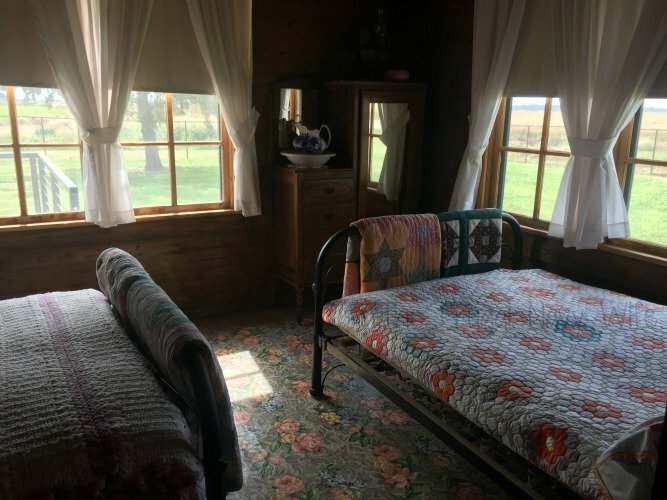 There were two bedrooms. The boys shared and room (and beds) as seen above. 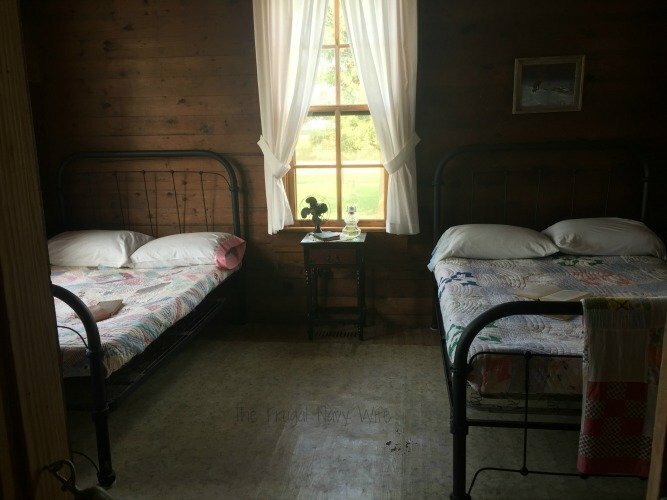 The girls shared a bed in the parent’s bedroom. It was tight quarters, but they made it work very well. Since there weren’t freezers and fridges back then, they had to have ice delivered. 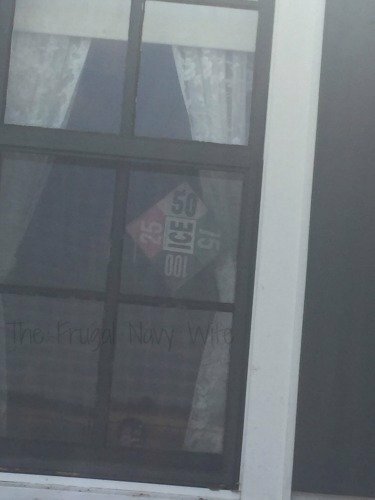 The sign in the window showed how much ice they needed from the road, so they ice man knew what to deliver. 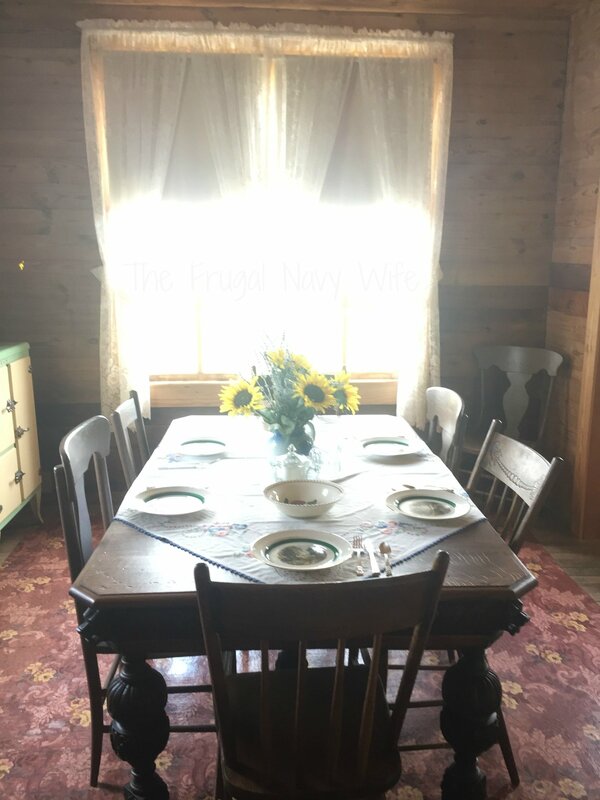 The house was big enough for everything they needed and back then the family spent a lot of time outdoors working the land and playing outside. Learning what I have, I think this was a great concept to get people back on their feet after the great depression and wonder why more of these weren’t built and why we didn’t learn more about them in school!